"He's the legendary Man in the Silver Mask. More than a famous wrestler, he fights for justice and defends people against crime." The Short Version: Arguably the finest example of Mexi-horror Lucha Libre cinema, this combo HOUSE OF WAX ('53) and ISLAND OF LOST SOULS ('32) excels primarily for a dominating, duplicitously evil performance by Claudio Brook. Just one of many high points, his evocation of a former concentration camp survivor creating monsters via human subjects makes for a formidable foe for the masked wrestler-crime fighter. A good script and capable direction equates to a great starting point for the curious and those looking on cult cinemas outskirts for something new. Dr. Karol is the eccentric proprietor of a wax museum made up of famous historical and Hollywood personalities. But beneath the house in a dungeon style grotto are the exhibits of a more macabre nature--Frankenstein's Monster, Quasimodo and an assortment of ghoulish creatures. Coinciding with a rash of disappearances, Dr. Karol becomes the prime suspect after Susana, a pretty magazine photographer, disappears while doing a story on the origins of Karol's monstrous exhibits. Through professor Galvan's recommendation, the doctor hires El Santo to help in clearing his name. It's all a ruse, though, as the doctor is quite insane. Within a secret chamber he conducts vile experiments on human guinea pigs turning them into monsters. His newest soon-to-be creation is a panther woman; and Susana is his subject for the transformation unless Santo can stop the mad scientist in time. Since this movie actually works from a good script, there's no need for a play by play of the picture from start to finish. The movie career of Mexico's celebrated wrestling sensation, El Santo was an equally lucrative opportunity to expand on his ringside legend in a way unheard of in America. The closest approximation would have to be overrated professional wrestling superstar, Hulk Hogan who had a brief career in movies. Santo's acting ventures extended over 50 movies of wildly varying quality. Granted, these were intended for family viewing, but occasionally, some striking moments of violence would creep in. While so many of the Saintly Ones movies are rudimentary at best, some of them are quite well made. Such is the case with SANTO IN THE WAX MUSEUM. It's quite possibly the best movie to star the Man In the Silver Mask, and, even with its wrestling scenes (which may be viewed as perplexing, padding, or intrusive to some), could very well stand comfortably next to some of Europe and America's best regarded Gothic horror works. "I want you to experience the suffering. You can't understand what it is like to be tortured...you don't know how sadistic humans can be...my only consolation is making others suffer. That's why I'm not going to kill you yet...human beings are monsters. Those who tortured me proved it. I want your face to reflect what's in every human soul. I want to create a world of physically deformed human beings where one can see the face of the Apocalypse. Famine, plague, war, death!" One of the keys to this films success is undoubtedly the performance of Claudio Brook, a well known Mexican actor that transcended borders to appear in a number of high profile US productions; these include RETURN OF A MAN CALLED HORSE (1976), the Bond film LICENSE TO KILL (1989), the Kevin Costner vehicle REVENGE (1990) and horror pictures like THE DEVIL'S RAIN (1975) and Guillermo Del Toro's CRONOS (1993). His performance as the devilish Dr. Karol elevates this movie to heights seldom attained in this genre. That's not to negate other enjoyable entries in Mexi-horror, it's just that these films are primarily filled with standard Saturday matinee styled, comic book heroes and villains. The emotional devilry Brook brings to his role is existentially on an adult level; a far cry from the hooded madmen, flamboyant warlocks and other comic book evocations of villainy indigenous to Mexi-horror/Lucha Libre movies. In maintaining this modestly less kid friendly approach, Dr. Karol is revealed to have been a prisoner at an Auschwitz concentration camp during WW2. Tortured and maimed while a captive, he grew to hate mankind, especially the beauty of a woman; desiring only to destroy that beauty with his monstrous creations. Not only does this classy Mexican production emulate the 'wax museum' movies popularized by HOUSE OF WAX (a color remake of 1933s MYSTERY OF THE WAX MUSEUM) starring Vincent Price, but there's also clear penance paid to 1932s powerful, controversial horror classic, ISLAND OF LOST SOULS. Both that films Dr. Moreau and this pictures Dr. Karol are the embodiment of evil; the latter being doubly insidious as he seeks to destroy beauty through the pain of torture and deformity. He seeks no world with which to rule, he simply wants to destroy those living in it. And like Moreau's ultimate experiment being the Panther Girl, so is Karol's pet project. Considering this was made in the 1960s, Alfonso Blake's movie (he also wrote the screenplay) is benefited by the inclusion of a concentration camp backstory to add more shades of horror through the template of WW2 atrocities. With all this talk of Brook's character, one might forget all about El Santo. Santo sometimes takes a backseat in his own movies. It's not an unusual occurrence. Sometimes Enmascarado de Plata doesn't show up till 30 minutes into his pictures. 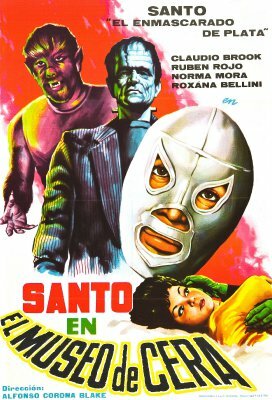 While Santo is definitely not hidden from view in this film, Brook is so mesmerizing, particularly during the films second half, that he steals the movie away from the silver masked wrestler. And what would a Santo venture be without wrestling matches? There are three of them here and, unlike other movies, none of them are integrated into the storyline. Even so, the wrestlers seen here have personality which makes enjoying the matches a pleasant endeavor. The other wrestlers are as follows: El Cavernario, an ape-ish man and a brawler; an unknown masked man, whose mask looks like the same one worn by El Vampiro in SANTO & BLUE DEMON VS. THE MONSTERS (1970). This match begins in progress so we never learn what this man's name is. This is the most standard of the three matches, standing out only in that it's two masked men grappling and flipping all over the place. The third is the most lively and entertaining. Santo tackles this Nature Boy, French dandy named Denny Galoin. Galoin does this bizarre one legged strut across the ring when he gets a lick in on Santo. Instead of capitalizing on it, he showboats. A sure fire way to get your crowd all worked up! This picture is also unusual in that it's a rare occasion where we see Santo take a near fatal blow from a bald, knife-throwing assassin's blade. We also get a look into Santo's main headquarters, which seemingly doubles as his home. Those wackily intrusive Orwellian 1984-esque closed circuit monitors are on display here again, yet also work against our heroes when Dr. Karol covertly utilizes the electronic gizmo in professor Galvan's office to learn what Santo's plans are. That a professional wrestler moonlights as a secret agent/crime fighter might be seen as silly by many, but this concept is perfectly acceptable within the realm of Mexican fantasy cinema. One can't help but chuckle, though, when Santo discusses a man's plight, then tells him he'll get back with him later as he has to go wrestle. Santo is a very busy man, indeed. This is also the longest Santo movie I can recall. Clocking in at 92 minutes, most of these movies generally run anywhere between 76 and 82 minutes. Blake's script is unusually well crafted; more so than normally afforded this sort of entertainment. Unlike other directors of Mexi-horror, Blake displayed an assured hand even if some kitsch would manage to shine through (most noticeably in the dubbed versions of these movies). here and there. Blake was also the director of two of the most best loved examples of Mexi-horror cinema--the surrealistic THE WORLD OF THE VAMPIRES (1961) and the uber Santo cult favorite SAMSON VS. THE VAMPIRE WOMEN (1962); Santo being retitled as Samson for US consumption for both VAMPIRE WOMEN and WAX MUSEUM. Likewise, Fernando Mendez (THE VAMPIRE , THE BLACK PIT OF DR. M ) and Rafael Baledon (THE CURSE OF THE CRYING WOMAN ) had established themselves as good hands at spooking audiences. Chano Urueta should be included as well with such films as the gruesome THE WITCHES MIRROR (1962) and the sublimely ridiculous THE BRAINIAC (1962). As with horror films of other countries, the Golden Age of Mexi-horror cinema reaps the best examples of the form, especially in capturing a thick Gothic atmosphere. SANTO IN THE WAX MUSEUM falls into this category. The early, B/W Santo flicks were the best, at least in my opinion. They are undoubtedly superior in cinematography and budgets; although these films were always low cost affairs, the earlier pictures had a professionalism and polish that was woefully absent in the later color productions. The beyond prolific Jose Ortiz Ramos's camera captures some beautifully arcane moments here, particularly in the underground grotto where the more macabre exhibits are displayed. It also plays home to an adjoining secret laboratory. Certain well lit moments convey a dark beauty that color could never duplicate; unmatched in the monochrome format. Ramos, who has well over 200 assignments to his credit, worked on some of the genres biggest, and most well known movies including Santo's premiere venture, SANTO VS. THE ZOMBIES (1962), the aforementioned SANTO VS. THE VAMPIRE WOMEN (1962) and THE BRAINIAC (1962). Ramos also lent his skills to the celebrated THE CURSE OF THE CRYING WOMAN (1963), one of the best renditions of the La Llorona legend. Raul Lavista's energetic score is, like the early Santo movies, far and away superior from the later elevator musical accompaniment that would dominate the 70s films of the Lucha Libre genre. It's not perfect by any means, but SANTO EN EL MUSEO DE CERA (1963) is arguably the finest example of this genre and comparable with similar pictures of this vintage from other countries. The main star being a wrestler who is also a shirtless crime fighter wearing a cape zipping around in a convertible will be rife for jokes in the mainstream. Familiarizing oneself with this cultural phenom is essential in appreciating the films on a level outside the realm of camp. As said above, the script and performance of Claudio Brook elevates this movie to a precipice rarely attained by the bulk of these primarily kid friendly presentations. This review is representative of the Alter Films-RTC DVD. There are English subtitles.